Located 1.5 miles East of downtown Pagosa Springs, Colorado, L Bar Z Ranch is a private working ranch right off of Highway 160. 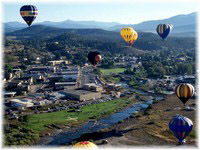 Pagosa Springs is a quaint town that sits at an elevation of more than 7000 feet above sea level. Surrounded by the San Juan National Forest, Pagosa is home to abundant wildlife, wildflowers, and recreational activities. The incredible San Juan Mountains border the North and East side of town with Wolf Creek Ski area only 26 miles from town. The town is famous for its world class Hot Springs as well as fishing and rafting along the San Juan River which flows through town. For more information on Pagosa Springs, go to Pagosa Springs Visitor Center. From Durango, CO: Take Hwy 160 East about 60 miles into downtown Pagosa Springs. Follow (main street) Hwy 160 through town and continue East. From the junction of Hwy 160 and Hwy 84 continue on Hwy 160 about 1.5 miles. On the East side of the Hwy will be San Juan Veterinary Hospital. Turn left after the Hospital into our driveway (river side) and please check in at 2 story log home on left. Our address: 2244 E Hwy 160. From Santa Fe, NM: Follow US Hwy 285North/Hwy 84 for about 2 hours.s At Chama, New Mexico turn left onto Hwy 84 about 45 minutes to junction of Hwy 84 and Hwy 160. Turn right and travel 1.5 miles. You will pass the San Juan Veterinary Hospital on the right and our driveway is the immediate left(river side). Please check in at 2 story log home on the left address: 2244 E. Hwy 160. Pagosa Springs cabins, Pagosa vacation rentals, Pagosa Springs lodging, Pagosa Springs accommodations, fishing in Pagosa Springs, San Juan River fishing, colorado vacation rentals, Southwest Colorado vacations, Colorado cabins. Colorado ranches, Archuleta County lodging, Pagosa Springs, CO cabins, skiing at Wolf Creek, Colorado horseback riding, L Bar Z Ranch cabins, staying in Colorado.